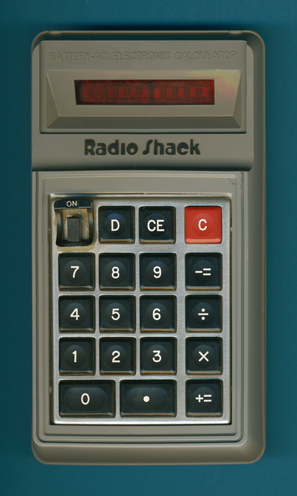 This Radio Shack Electronic Calculator EC-100 seems to be a minor variation of the original EC-100 with a small metal piece covering the "K" on the keyboard switch. Dismantling this Radio Shack EC-100 manufactured in 1973 reveals a well-known design centered around a TMS0100-series single-chip calculator circuit from Texas Instruments. © Joerg Woerner, December 29, 2017. No reprints without written permission.